Here is a quick guide to many of the most commonly used tools and resources that OR&R offers for chemical spill responders and planners. General emergency responders may also want to refer to the quick list of tools and resources for oil spill response. ALOHA®, a modeling program that estimates hazards after a chemical release. CAMEO Chemicals, a database of hazardous chemical datasheets you can use to get response recommendations and predict hazards. Available in online and downloadable versions. 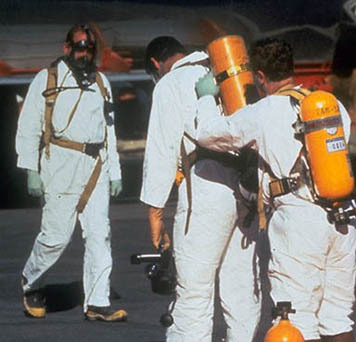 CAMEOfm, an application to access and manage chemical property and emergency response information. RMP*Comp, a program that helps chemical facilities that fall under the RMP rule complete their required offsite consequence analysis. Tier2 Submit™, a program that helps chemical facilities meet their Tier II reporting requirements under Sections 311 and 312 of EPCRA. CAFE Database, a program to help responders in their assessment of environmental impacts from chemical or oil spills into an aquatic environment. Training, training resources for CAMEO. Learn more about OR&R's tools and resources for chemical spill response. You can also find contact information for SSCs around the U.S., and a sampling of research publications written by OR&R scientists and other partners.